Gy�r at the meeting point of the rivers Danube, R�ba and R�bca is often called "the town of rivers". 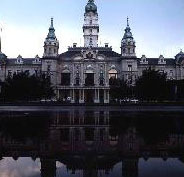 It is the gateway to the west, situated between the Austrian and the Hungarian Capital. This is a Baroque and neo-Classical town, with a magnificent cathedral, palaces, doorways framed in stone, and elaborate wrought iron decorations. The majority of protected buildings stand within the 16th century city-walls. See the Town Hall, the Sz�chenyi Pharmacy Museum, the lavishly decorated Rosalia house, the Carmelite church, the Municipal Gallery, and many more. Gy�r On the K�ptalan Hill, the episcopal castle stands face to face with the imposing baroque cathedral. The masterpiece of medieval Hungarian goldsmith's craft, the statue of St. L�szl� (Hungarian king) is kept here. 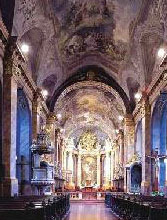 The treasury of the cathedral has the second richest ecclesiastic collection in Hungary. The town is an important educational center: among its famous teachers was Jedlik �nyos, who invented the dynamo. Two famous artists, the ceramicist Kov�cs Margit and the sculptor, Borsos Mikl�s were born here. The ceramics of Ms. Kov�cs can be seen in the Kreszta House, while the Borsos Mikl�s Memorial House displays his sculpture collection. Gy�r Ballet Company Every year, during the Gy�r Summer International Cultural Festival, the scenery of the baroque inner city provides the background for the international ballet, a street-theatre and puppet festival, as well as a folk dance and folk music festival. The Gy�ri National Theatre and the Gy�r Philharmonic and the world-famous Gy�r Ballet Company are the hosts of several foreign companies, musicians and bands.